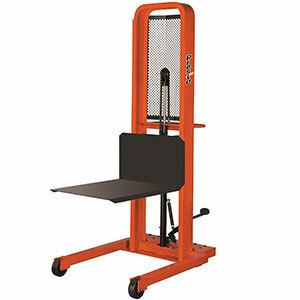 This foot operated stacker is perfect for low-volume stacking and load transporting. It features a foot operated pump with a tip toe release. The lifting platform works great as a portable lift table for many different ergonomical applications. The stacker incorporates an impressive number of safety features in a rugged, user-friendly design. It includes a perforated metal screen to block falling debris to help keep the operator safe. High-impact phenolic wheels, which can be used on almost any type of floor, provide excellent maneuverability. The stacker also has a floor lock that keeps it stationary when needed. Raised-Lowered Ht. : 52" - 5-1/4"
Platform Dimensions: 24" x 24"
Approximate Lift Per Stroke: 1-1/8"
Load center is the horizontal distance from the back of the forks or platform to the center of the load being lifted. It is just as important as the weight capacity is. 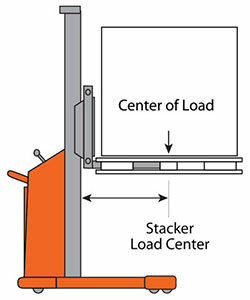 The length of the load must not be longer than twice the size of the rated load center. Hydraulic Cantilever Table, 24" x 36" Platform, 24" to 36"H, 2000 lb. Cap.